Things have moved forward in the Microsoft’s Azure cloud platform since I very first started using Azure. One thing is for sure is that the number of services available has grown and with this growth comes the responsibility of ensuring that you can successfully deploy what you have built with the minimum about of trouble in the quickest possible time. Along came the Azure Resource Manager (ARM) which is the service used to provision resources in your Azure subscription. It was first announced at Build 2014 when the new Azure portal (portal.azure.com) was announced and provides a new set of JSON API’s that are used to provision resources. Before ARM, developers and IT professionals used the Azure Service Management API and the old portal (manage.windowsazure.com) to provision resources. Both portals and sets support the of API’s. However, going forward you should be using ARM, the new API’s, and the new Azure portal to provision and manage your Azure resources. 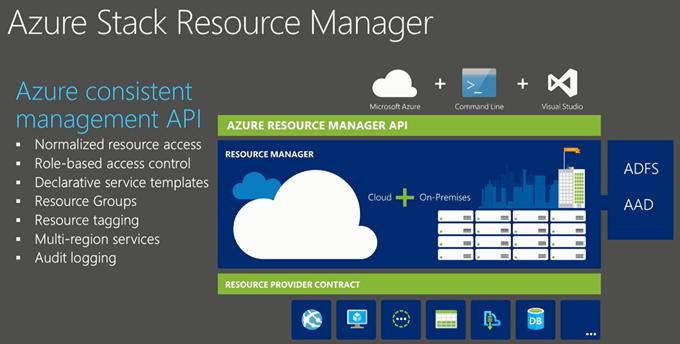 Azure Friday has a nice easy overview of the Azure Resource Manager. Scott talks to Mahesh Thiagarajan about the new Azure JSON-based APIs for Azure that now include Compute, Network, and Storage. Orchestrating large system deployments is easier and more declarative than ever. Azure Resouce Management provides us with a way to describe resources in a resource group using JSON documents. There are many resource groups, for example, Web App, Storage Account, SQL Database. In the JSON document, you can describe the properties for each of the resources such as the type of storage account, the size of the SQL Database, and settings for the Web App; there are many more options available. The advantage here is that we can describe the environment we want and send that to Azure Resource Management to make it happen. Before ARM, you had to provision resources independently to support your application, and it was up to you to figure dependencies between resources and accommodate for these in your deployment scripts. ARM is also able to determine when it can provision resources simultaneously allow for faster provisioning of all the resources described in the resource group is achieved. Before ARM, the relationship between resources (i.e. a web app and a database) was something you had to manage yourself. Include trying to compute costs across multiple resources to determine the all-up costs for an application. In the ARM era, since the resource group containing the resources for your application are a single unit of deployment, the resource group also becomes a unit of management. By resource grouping it enables you to do things like determining costs for the entire resource group (and all he resources within), making accounting and chargebacks easier to manage. Before ARM, if you wanted to enable a user or group of users to manage the resources for a particular application, then you had to make them a co-administrator on your Azure Subscription. The users have full capability to add, delete, and modify any resource in the subscription, not just the resources for that application. With ARM, you can configure Role-Based Access Control for resources and resource groups, enabling you to assign management permissions to only the resource group for only the users that need access to manage it. When those users sign-in to Azure they will be able to see the resource group you gave them access to but not the rest of the resources in your subscription. You can even assign Role-Based Access Control permissions to individual resources if you needed to. Post ARM, automating the provisioning of resources meant that you had to account for situations where some, but not all, of your resources, would be successfully provisioned. With ARM, when you send it the JSON document describing your environment, ARM knows which resources already exist and which ones do not and will provision only the resources missing to complete the resource group. The Azure portal is an excellent way to get started using Azure Resource Manager with nothing more than your browser. When you create resources using the Azure portal (portal.azure.com) you are using ARM. Eventually, you will need to write a deployment template that describes all the resources you want ARM to provision. And to be scalable, you will need to automate the deployment. You could start with something from the Azure Quick start Templates, but at some point, you will likely need (or want) to build your deployment template from scratch. For this, Visual Studio and PowerShell are the two tools are strongly recommended. When it is time to write your ARM deployment templates, you will find that Visual Studio and the Azure Tools delivers an incredible experience that includes JSON IntelliSense in the editor and a JSON outline tool to visualise the resources. Writing ARM deployment templates is not a trivial task. By using Visual Studio and the Azure Tools, you will be able to create deployment templates from scratch in a matter of minutes. A version of the Azure Tools SDK is available for VS 2015. 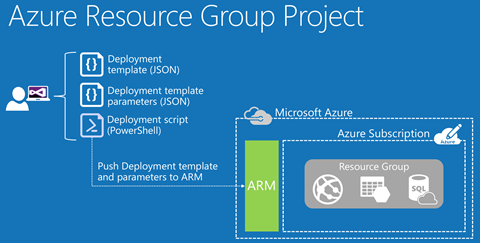 The Azure Tools provides an Azure Resource Group project template to get you started as shown below. In subsequent posts, I’ll be demonstrating how to use this project template. The project template mentioned in the previous section generates a PowerShell deployment script that can be used to send your deployment to ARM in an automated manner. The script uses the latest Azure “RM” Cmdlets that you can download and install from here. Most of the code in the deployment script handles uploading artefacts that ARM may need to deploy your environment. For example, if your deployment template describes a virtual machine that requires a DSC extension to add additional configuration to the VM after Azure has created it, then the DSC package (zip file) would need to be generated and uploaded to a storage account for ARM to use while it is provisioning the VM. But, if you scroll down past all that to the bottom of the script file you will see two commands in the script (shown below). The first command, New-AzureRmResourceGroup, only creates the resource group using a resource group name that you provide. The second command, New-AzureRmResourceGroupDeployment, pushes your deployment template and parameters for the deployment template to ARM. After ARM receives the files, it starts provisioning the resources described in your deployment template. A workflow diagram of how these tools are used to deploy an environment using Azure Resource Manager is shown here. In this post, We’ve introduced Azure Resource Manager and highlighted some significant advantages it brings to the platform. Concluded by adding a couple of tools you should consider using to author your deployment templates.